This tandem paragliding flight is our most popular activity. Accompanied by an experienced pilot, you will have the pleasure of flying in front of the Prealps with stunning views of Gruyère. This flight is longer than the discovery flight, giving you more time to enjoy this wonderful feeling of freedom. The tandem flight runs from late morning to evening. Your pilot will take beautiful and amazing pictures and videos throughout the flight, which you can buy for an extra 30 CHF if you like. Comfortably sitting in your saddle/harness, you’ll soar high above the ground, enjoying sights such as the pine forest, Alpine chalets, mountain roads, herds of cattle, colourful meadows and villages. If ascent conditions are favourable on the day, you can even fly the peaks of the Prealps during your flight. Feel free to contact us if you have any questions about this activity, which is also suitable for families. 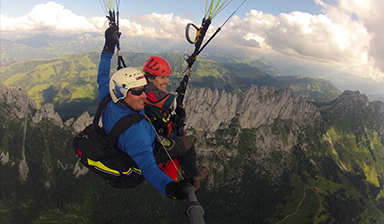 We can also arrange tandem flights for groups, with a special price for 5 people of 165 CHF/pers.